A Flower For Mom – He Said What?! I’m sitting here at the computer, taking a little breather from Aaron and his incessant talking, and trying to decide how to convey Aaron in my writing. He is so interesting, yet so exhausting; so funny, yet so frustrating; so predictable, yet so surprising. Sometimes I just can’t fully explain or project the complexities and the simplicities of Aaron. I sigh and think of what and who is really weird, but I just assure Aaron that he should not fuss at those scanner people…….and I hope that soon he’ll just GET OVER IT!!! Just like I’m longing for him to get over the new PC game he saw at Wal-Mart that he is wanting to buy. Alien……which is right down Aaron’s alley because it’s full of growling, slimy aliens that your character must kill. Gary and I want to research this game before we say yes or no. Aaron isn’t into research………..he’s into talking us down to a level of no resistance. He was discussing this game while I was getting ready the other morning. 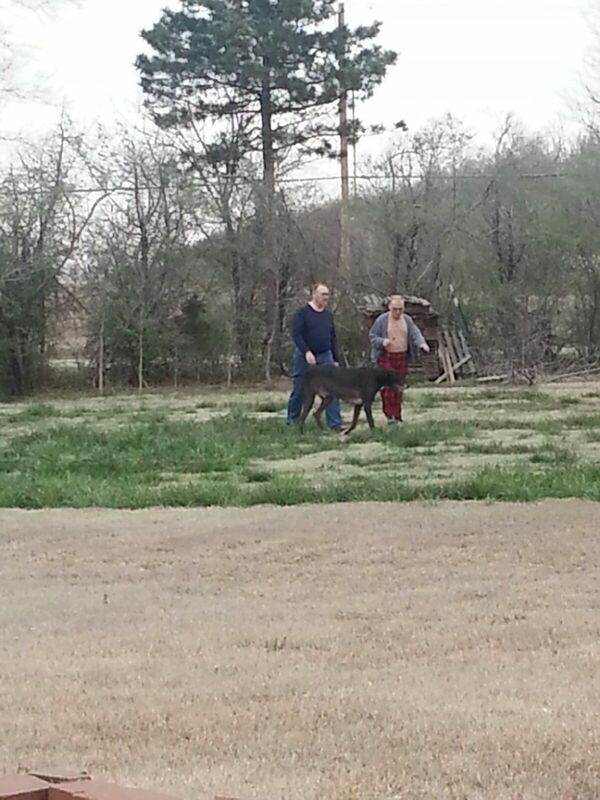 He asked repeatedly if and when we could go to Wal-Mart to check it out…….which to Aaron means to buy it. And he says what he often says when making these requests – “Mom, I’m not making you!” As he talked on and on the other morning, he tried a new tactic as he asked if we could probably go to Wal-Mart. “Mom, I said probably! Does that mean making you?” Clever, Aaron – very clever. That night I saw predictable Aaron as he came down to the kitchen. It was time for bed, and he took his pills. He then headed for the guest bathroom, because he prefers it more than his bathroom upstairs. Aaron must always say goodnight, and he very much prefers to say goodnight in his room. I reached out to give him a goodnight hug in the family room and he backed away. He knew I wasn’t going to wait on him to use the bathroom, so he thumped up the stairs and walked into his room. I followed obediently, knowing exactly what was happening. He stepped into his room, turned and gave me a goodnight hug, and then went back downstairs to use the bathroom. Yes, predictable Aaron. The next day he told me that he was tired because he stayed up reading too late. Aaron will only read at night before bed, all propped up just so-so in his bed as he reads one of his Handy Answer books. As he told me that he was tired, he began discussing Latin names of animals. Last night I discovered why he was talking about Latin animal names and why he had been tired that morning. 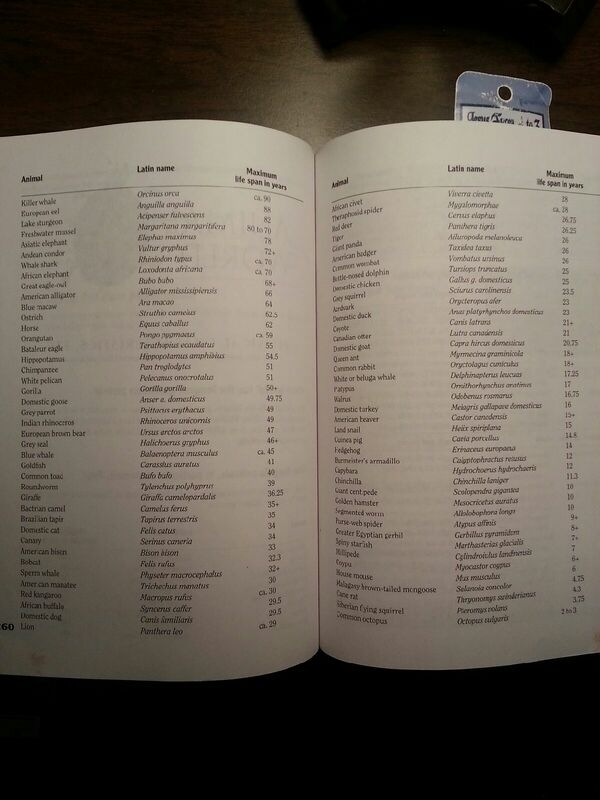 Aaron, who reads EVERY word of his Handy Answer books, had read this long list of English/Latin animal names, along with the animal’s expected life span. He showed me the list that was on several pages, and also pointed out how he had read across the list…………every name…….every single name. I just shook my head in disbelief while he was again unaware of how amazing he is. I took the “flower” that was handed to me and saw that it was Chickweed. And even though I didn’t really want a Chickweed flower, I shrugged off my resistance and accepted it gratefully. Aaron was very pleased with the “flower” he had given to Mom, and I was so touched by his earnest show of love. 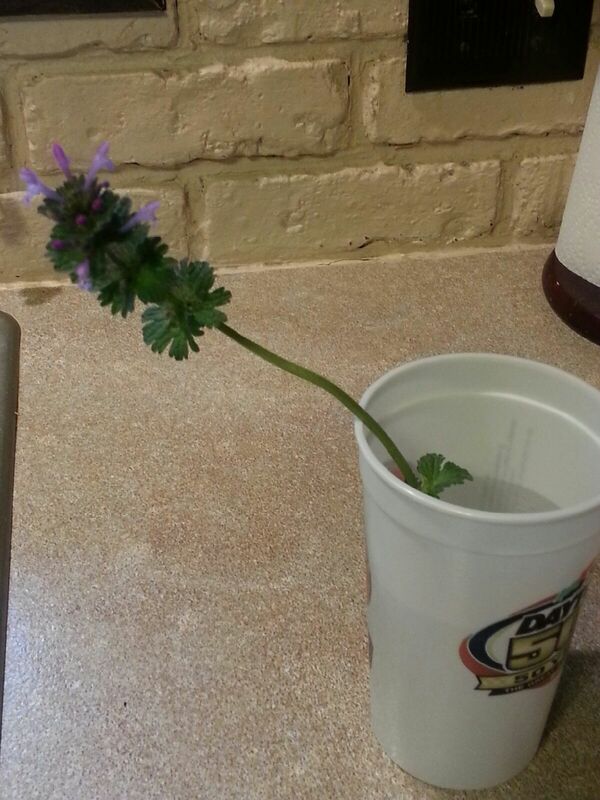 I put the “flower” in a glass of water, where it is thriving. Aaron loves the little blue flowers that are really purple………..but Aaron is color blind and so to him this pretty “flower” is indeed blue. And I am relieved that at least he didn’t pick this “flower” from the neighbor’s flower bed, which he has been known to do. These incidents are just the tip of the iceberg that is Aaron. And just as with a real iceberg, the majority of which is underwater, so it is with Aaron. There is so much more to him than meets the eye. It takes some time to understand him, and just when you think you do, he does something that catches you by surprise. That’s what I think of when I look at my pretty Chickweed “flower.” I’m glad I saved it and didn’t toss it in the trash. And I’m always glad when I take the time to understand Aaron, and not just toss him aside in frustration. But I do roll my eyes a lot! Next Next post: When Is It TOTAL Morning?